The 45-year-old actor – who was axed from hit show 'Two and a Half Men' earlier this year due to his erratic behavior and turbulent personal life – is in talks to appear in a new show based on the 2003 movie 'Anger Management. Producer Joe Roth wants Charlie to portray an athlete-turned counselor – originally played by Jack Nicholson in the movie – who enrages his patients more than calming them down and has his own problems with rage, the Hollywood Reporter states. Though the planned programme has not yet received a finance or distribution deal, the hope is for a pilot episode to be ready for autumn 2012. 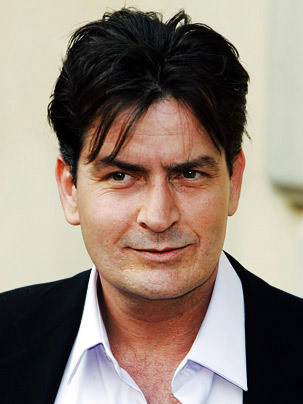 Charlie's spokesperson said: "Receiving several opportunities but can't comment on anything at this time." Joe has previously worked with the actor on five movie projects, including 'Major League' and 'Young Guns'. The troubled star is to be subjected to an evening of comic heckling on the one-off show, which will air on September 19 - the same night as Ashton Kutcher makes his debut on 'Two and a Half Men'. Kent Alterman, Comedy Central's head of programming, said: "Charlie has assured us that nothing will be off limits in this Roast, which scares even us." However, Charlie is well aware of the plethora of material his turbulent personal life will provide for those taking part in the episode. He added: "You could say I've been providing kindling for this 'Roast' for a while. It's time to light it up. It's going to be epic."